Rosary beads are just one example from a growing trend of accessories inspired by religious orders. What is the significance behind rosary beads and why have they become so prominent in recent years? From pop stars wearing them over corset dresses and vintage rock t-shirts to popular novels that celebrate the significance of rosary beads through their main characters, rosary beads have generated a new-found interest in the accessory. With the comeuppance of rosary beads as a fashion trend, more designers have come to embrace the trend and put their own spin on the Catholic jewellery. Subsequently, there is more selection available for followers of the Christian faith to express their individuality. These days, rosary beads have moved from more obscure fashion to bigger and bolder versions that can be seen dangling from necklaces, bangles, earrings, and even belt buckles. Expressing spirituality through fashion accessories is seen by many as a natural progression in the fashion world and now with more choice out there, followers of the Christian faith can proud display their belief with elegance and class. If you are considering religious jewellery as a gift, rosary beads are not the only options to consider when it comes to faith-based jewellery. Other offerings include cross bracelets, pendants, cross earrings, and special medallions that are perfect for men and women. There are also different precious metals and gems that offer people the chance to express their religious views with unique jewellery that appeal to a broad range of enthusiasts. Blog submitted by Christian.Jewelry. 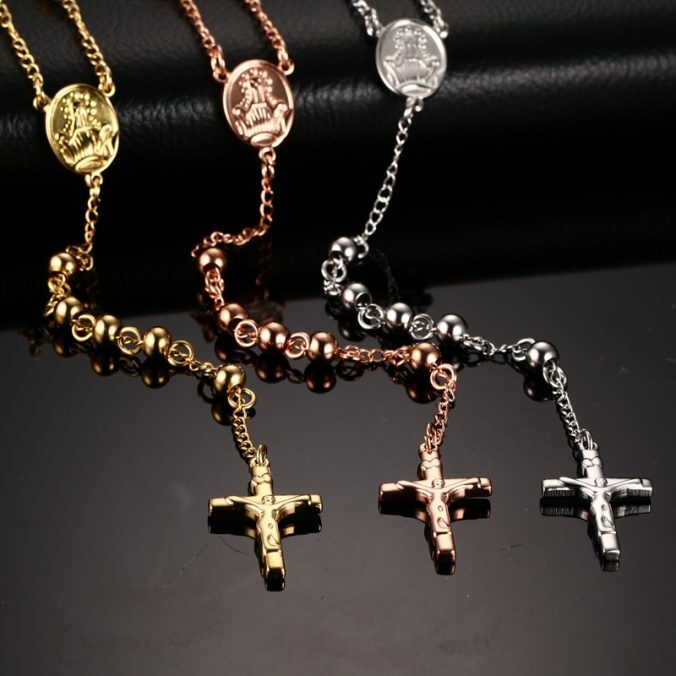 : Offering Christian jewelry in Silver and Gold, such as cross pendants, necklace, rings, earrings, bracelets and chains. Although the months of spending time at the beach, BBQ-ing and wearing summer dresses are long gone, there is plenty to look forward to in Fall. Here are five items that will help you survive Fall in style. A lightweight jacket – As the temperature starts to drop, you may need something warmer than a cardigan to keep away the chills. A good addition to your wardrobe is a lightweight jacket like a trench coat, denim jacket or a blazer, which can also be used all year around. Look for colors in neutral shades like black, beige, tan and gray for versatility. Great Jeans – Jeans are a simple addition to any wardrobe and one that will never go out of style. At the moment straight leg, boyfriend jeans are popular and worn above the ankles. Ankle boots – High heeled ankle boots are the perfect addition to your wardrobe. Look at designs in leather, suede, velvet, sequin or brocade. A new bag – Place your summer weaved and fabric bags in storage and replace them with more structured leather bags like a duffle bag that will fit most of your items. Statement sweater – An oversized sweater is a stylish addition to any wardrobe. If you want to give your sweater structure, add a leather belt, and you’ve got the perfect look for fall. Look for sweaters in fun pastels like peach, light green, and baby blue.